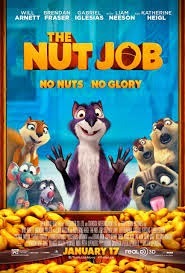 THE NUT JOB is an animated comedy following the animal inhabitants of a city park. When loner squirrel Surly (Will Arnett) selfishly foils the other animals' plan to swipe some nuts from a nut cart, Raccoon (Liam Neeson), the park leader, banishes him to the city. Exiled from the park, Surly and his best pal, a rat named Buddy, endure a frightening day in the city when they land right in front of a nut shop. Unbeknownst to Surly and Buddy, the owner of the nut shop is a recently released gangster King (Stephen Lang), and his crew of goons are planning to rob the bank across the street by digging a tunnel between the buildings. Meanwhile, Surly and a team from the park, led by determined female squirrel Andie (Katherine Heigl), plan their own heist -- of the nuts in the shop. Remember the old candy bar slogan, "Sometimes you feel like a nut? Sometimes you don't?" -- well let's just say you probably won't feel like this particular Nut, but if you take your kids, the very youngest will probably dig the silliness. That is because most kids of a particular single-digit age will like any thing that makes them laugh and has gross-out jokes about burping and flatulence. The Nut Job offers those sorts of lowbrow scatological amusements in addition to the whole "talking animal" novelty that never seems to wear off for kids. But as for an animated movie that will appeal to older kids and parents, this isn't it. First off, it's never quite clear when the movie is set. The human characters talk and look bit like they're in a '30s or '40s black-and-white gangster film, but the cars -- particularly the occasional checkered cab -- are more identifiably from the '50s, and the music includes electronic dance music like the 2012 South Korean dance hit, Gangnam Style. In addition to the decade confusion, the pacing is often way off, with strange editing hiccups that lead to an uneven viewing experience. And let's not even get started on the build up of both human and animal heists (the title refers to both) that never really leads anywhere. Some kids may not care about any of these flaws, because, of course, there are still animal farts and punny nut jokes involved. But parents, be aware this is far from a sophisticated animated comedy.